Well-known reggae grouping in the country, Black Missionaries band has distanced itself from the show organized by the ruling Democratic Progressive Party (DPP) on Sunday in the commercial capital Blantyre. 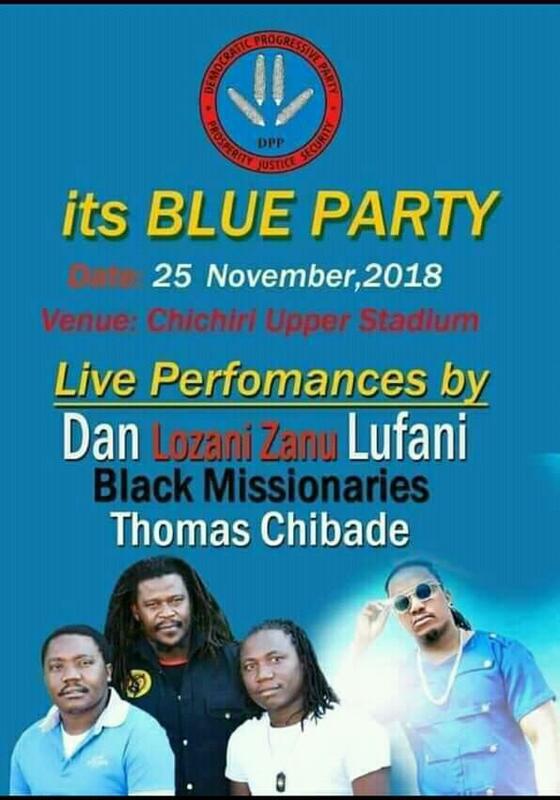 The social media especially Facebook is awash with poster indicating that the reggae outfit will share a stage with Dan Lufani of ‘Lozani Zanu’ hit single, a pro-Mutharika song and Thomas Chibade at an event dubbed ‘Blue Party’ to be held at Upper Stadium. Speaking in an interview with the press, Black Missionaries Band Manager Ray Harawa distanced the grouping the show, saying the poster is fake. “This being a second time for a thing like this to happen we would like to ask those doing this to immediately stop,” said Harawa. According to Harawa, the grouping will this coming Sunday be performing at a memorial service of Evison Matafale in Chileka. He said the show will start at 10am. Some of the artists to perform at the memorial service are as follows; Young Generations, Limbani Banda, Anthony Makondetsa, Wailling Brothers Band and others.